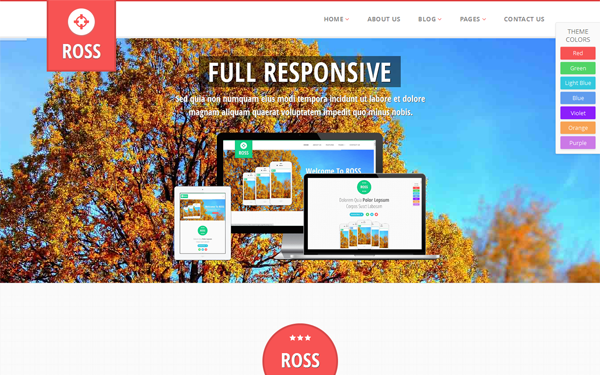 ROSS is an amazing bootstrap based theme which comes with tons of features. It is a parallax theme which comes as one page, multi page and eCommerce theme. It is the one stop solution for all your needs. It comes with 4 different sliders namely Flex Slider, Revolution slider, BX Slider, Bootstrap Slider. It also supports 7 colors namely red, light blue, dark blue, violet, purple, orange, green. If you are searching for next great bootstrap theme this go with ROSS. Has lots of great animations. Thanks to animate.css and way points plugin. 4 different sliders (Flex, BX slider, Bootstrap default slider and Flex slider). eCommerce version to launch your own shop. It includes all basic pages a shop needs. Item Reviewed: ROSS - Multipurpose Parallax Theme (Bootstrap 3) 9 out of 10 based on 10 ratings. 9 user reviews.